Romanian Kitsch Museum is not hard to find. Possibly blinded by an incredibly kitschy curtain of thousands of Christmas lights at Taverna Covaci in Strada Covaci, Google map makes a mistake by pointing the kitsch cathedral’s location across the road of this pompous food Bethlehem. But to access the place where the kitsch is sacred, one needs to turn to Strada Soarelui! 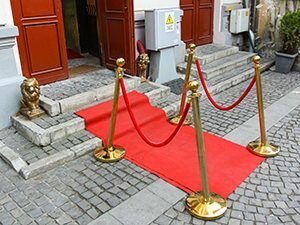 In this dead-end street (of course, in the kitsch universe there can be no forward), a little red carpet and gold lion statues unmistakably adorn the entrance into one of the youngest Bucharest museums. 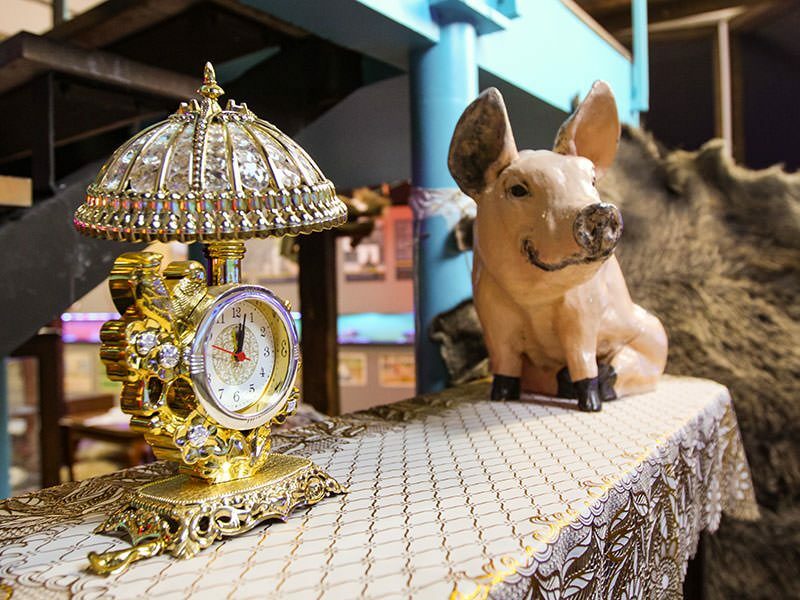 Cristian Lica, the institution’s founder, has been collecting the objects and stories of poor taste for over two decades. He claims that his boutique museum is the best way to understanding the Romanian (sub)culture. Romanian kitsch is authentic, and built on creativity, ridiculousness and pride of Romanians, museum website exclaims. Since May 2017, two floors of more than 200 exhibits in the center of Bucharest Old Town witness this authenticity. At the museum door, I bump into some dreadlocked punks. One of them insists that I take a picture of him on the red carpet. They were in the museum for a photo session and now, with golden spray is in their hands, they airbrush their signatures on the street power box. Usually, they make graffiti on trains and insist I should visit their genuinely Gypsy neighborhood, where no photographer wants to come. “It gets wild, man! It is more dangerous than the Bronx!”, one of them promotes Bucharest’s suburb with pride. The staircase towards the upper floors of the building is decorated with murals that combine the incompatible. Street art aesthetics defends the urban concept of the museum of kitsch, deconstructing the icons of adoration from the start. 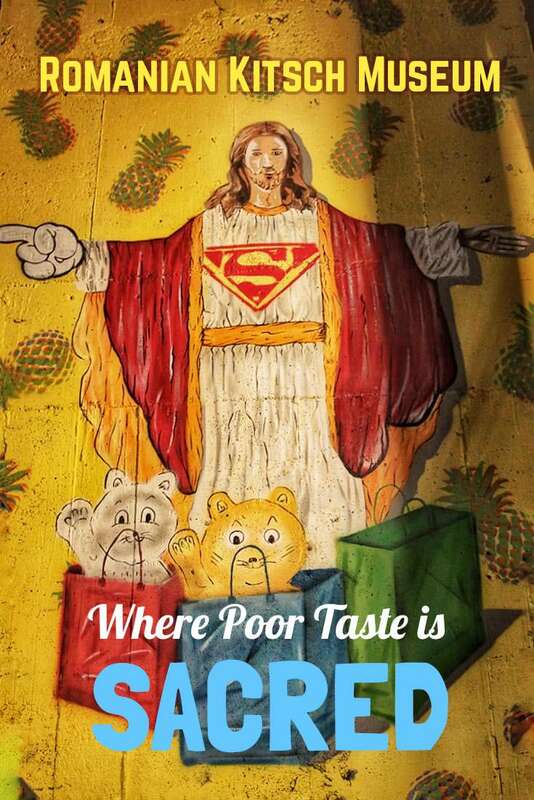 On the yellow wall, pineapples fly around the image of Jesus. With Superman’s sign on his chest and Disney characters’ 4-fingers glove on one hand, he stands in front of maneki-neko figurines wrapped in shopping bags, pointing towards the official museum entrance. 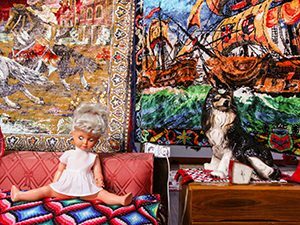 The items in the museum are presented in major thematic sections, displaying the archetypical images of Romanian kitsch. Many of them are not strictly Romanian; kitsch does not recognize borders, and trends travel quickly! In the world where Kim Kardashian becomes an influencer, Pitzipoanca concept is just a Romanian version of the same sort of intangible fame focused on one’s own appearance. In every country, one could find examples of poor misjudgment of aesthetics and functions. But even if kitsch might be universal, the window into one country’s kitsch does give a particular insight into its identities. Beware of Dracula, communists, priests and your home decoration! One of the most famous Romanian kitsch brands is Dracula, so he naturally opens the curatorial vision of the museum. 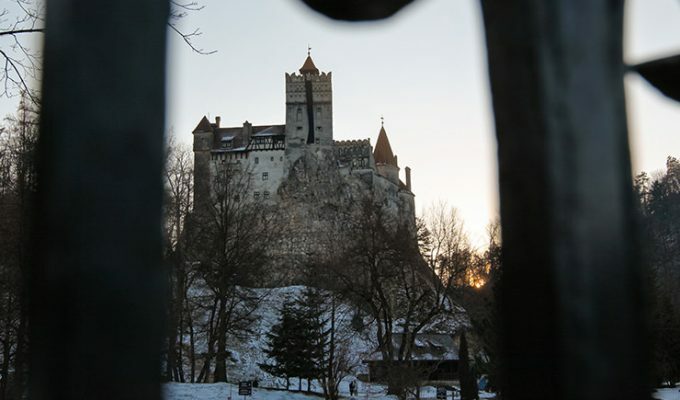 An imaginary character from Bram Stoker’s novel lived in Transylvania, which was not even a part of Romania in those times, and most of Romanians never heard of Dracula before the nineties, they explain. After the fall of communism, his story started to be exploited for touristic purposes, resulting in hilarious souvenirs, ‘alternative facts’ and even tabloid newspapers named after him! 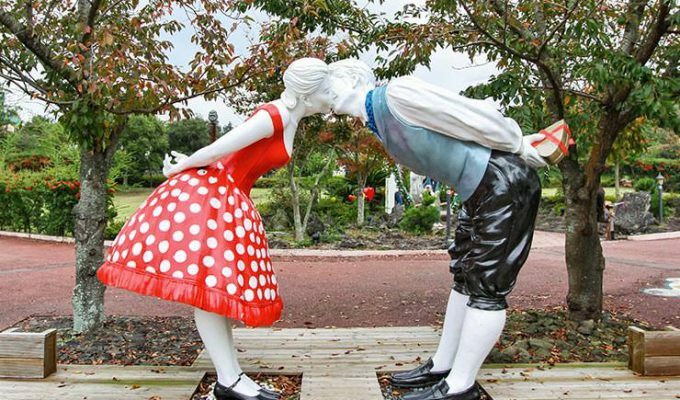 Romanian Kitsch Museum launched Romanian Kitsch Awards in 2017. Even if Dracula did rank high in the category of “historic and legendary kitsch”, he was beaten by the “doctor of chemistry” Elena Ceausescu, the famous dictator’s wife who gained her academic titles with four grades of elementary school! The gold medal in this award category went however to one iconic figure who managed to outstrip both of these worthy competitors – the “miraculous” Arsenie Boca, Orthodox monk who knew your name and your sins before you even confessed them. He could also tell you your future sins, as he was clairvoyant. One can never celebrate Jesus too much! Knowing this, it is very logical that next two sections of Romanian Kitsch Museum belong to religious and communist kitsch. One of them did not survive, but they both left or still leave visible traces of their influence in Romanian cultural space, wiggling in transition. Priests providing confessions online is just one strange example of reaching out towards the followers who need to finance the construction of all those opulent church palaces and priests’ lifestyle mounted in gold. This prime perversity, openly criticized by the museum, might be rocked only by the heritage of Nicolae Ceausescu and dictator’s dreams of erasing the Romania’s debts by starving its people, and irrational spending on costs such as constructing the most massive building in the world. The museum demasks another specificity of communism, still in use today. The so-called wooden language is the art of political speech in which one talks without saying anything. Horror interior design or a set for the horror movie? Works both ways! From these examples, one might conclude that the kitsch gets the full potential only when one is in power. However, kitsch became a part of the daily life of many Romanians. It became omnipresent in the design of the interior of people’s homes in the late 20th century. 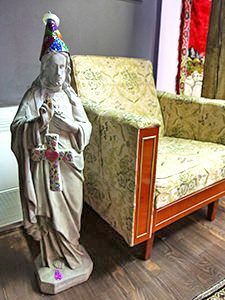 Gobelin of Mona Lisa, creepy stuffed animals, cheap porcelain figurines and plastic fruit on the dining table are just some of the examples of poor taste invading Romanian homes. In Gypsy culture, kitsch doesn’t stop at heavily ornate houses, but follows them even in the afterlife! Their rich tombs are furnished in marble and may feature accessories such as elevators, air conditioning or LCD TVs. Only the best for your beloved ones when they are gone! If you want to immortalize your kitschy moment too, Romanian Kitsch Museum offers you a photo corner with money rain. After this extravagant luxurious experience of someone else’s life, you can go back to your Bronx neighborhood reality, like those graffiti guys from the beginning of the story probably did. At the exit of the museum, there is a garbage bin, painted in gold. It is a subtle reminder that trash stays trash. Even when it shines. 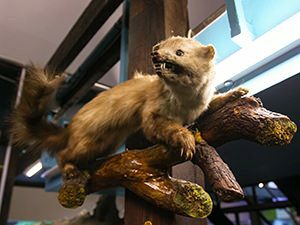 For further reading on kitsch and taste, I direct you to my article on the exhibition “Böse Dinge” (“Evil Things”). The article is in Croatian, but with an online translator, you might get a more thorough insight into displaying the deviations in taste. Searching for a place to stay in Bucharest? Disclosure: This post contains affiliate links, which means if you click on them and make a purchase, Pipeaway may make a small commission, with no additional cost to you. Thank you for supporting our work! It’s quite brave to raise that kind of mirror in front of your country. I think every country should open their own museum of kitsch! It must be a healthy therapy! That is FABULOUS. Great find! This place is incredible. We can’t help but stop at weird little attractions like this wherever we travel. Thanks for sharing. I am glad you liked it! Any other weird attraction you would like to recommend?